There are many parts of the world, like India, where slow 2G and 3G mobile networks are the norm. In places like this, when news breaks you’ll likely wait, and wait, and wait for articles to load on your smartphone. 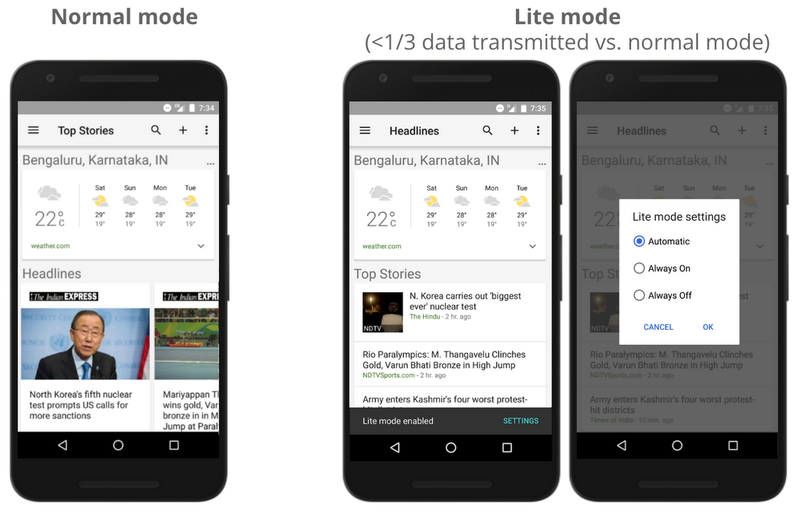 That’s why, starting this week, Google News and Weather for Android is introducing a new feature called Lite mode to help many of India’s 200 million smartphone users stay connected with news from around the world and in their local communities. We’ll be rolling this out to other countries in emerging markets in the coming months. In the full (normal) mode of Google News, as seen below, we aggregate headlines, images and related content, making it fast and easy for people to find articles they care about. In the new Lite mode things look a little different — we keep the headlines and trim the rest of the components down to their essentials so that the app loads more quickly (and uses less than one-third of the data). When people read an article in Lite mode, they’ll also benefit from Google’s previously announced faster and lighter mobile web pages. By default Lite mode triggers automatically when a slower network is detected (users can also choose to control Lite mode directly). Lite mode is part of our overall goal to provide news that matters to people around the world. A couple of months ago we started providing local news sources to users in all Google News editions globally (71 countries and 38 languages), building on an announcement back in May of a Local Source tag that surfaces local sources for national stories. We’re also working to bring news to people in their local languages. In India, we embarked on this effort back in 2007 with Hindi and have since expanded to include Malayalam, Tamil, Telegu and English, from more than 1,000 India-based publishers. We plan to bring Lite mode to users in Brazil and Indonesia later this year, and more places next year.